Ah, the second installment. Are you familiar with the age-old argument that the sequel is never as good as the original? This applies here. After all of my excitement, adrenaline, and urging of everyone I know to read The Hunger Games, this third of the trilogy has left me incredibly disappointed and deflated. The plot was slightly jarring and felt strange. Collins uses a lot of pages describing the events in District 12 prior to the real plot action which begins more than halfway into the book, and I really felt this could have been more diluted. The more important scenes seem as though they were rushed, especially the second to last chapter which I found diabolically fast-paced and impossible to comprehend. Although the plot is hugely similar to the previous novel, it just doesn't have the same feeling surrounding it. 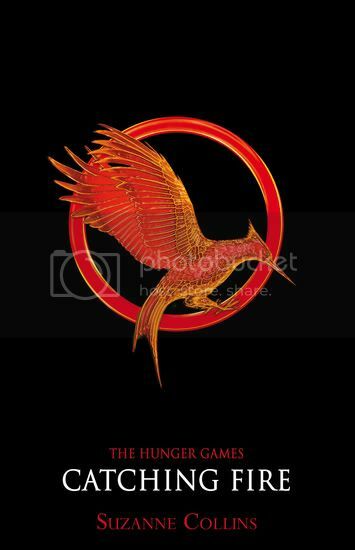 One of the factors of The Hunger Games which made me fall in love with it were the cliffhanger endings to chapters. I could not possibly put the book down, and was forced to read on. The chapter endings in Catching Fire hugely attempted to mirror those in The Hunger Games, but failed miserably. They were a half-arsed attempt to drag us in, and only really managed the odd groan from me rather than my previous hyperactive, breathless excitement at the thought of another chapter. Katniss shifts from the strong female protagonist into a bland pain. The first book depicts her as a firey survivor and now she is an emotional wreck. Of course, she has been through an ordeal but it really didn't seem as though this was reason behind her dreariness; I really think it's the writing. She dithers constantly - Peeta or Gale? Peeta or Gale? - these two are the same person. Strong boys in love with her, but stuck in the friend-zone until she actually grows a pair. They have minor differences, but nothing too memorable. There is none of the typical love triangle contention, and Peeta and Gale's similarities meant that I didn't care who she preferred, nor did I have any personal interest in how the situation turned out. The best part of the book is that it focuses more on politics and government control, and gives us more perspective on the forces at work. The idea of areas in revolt, the reasons for this, and the possibility of a successful rebellion under a totalitarian government is absolutely delicious. I enjoyed reading about the inner workings of the Capitol, the destruction which was a result of the previous rebellion, and most of all the rumours behind the fabled District 13. I must admit the final chapter did raise the game considerably, and did allow me some excitement in anticipating the final installment. I just wished the book had been as thrilling as this in its entirety. Perhaps I have been a bit too harsh here. Or have I? Am I dithering like our beloved Katniss? The book certainly did have its moments; I just think it dulls in comparison to its predecessor. It's very difficult for me to make valid comments here without posting spoilers, so I will refrain. Collins set the bar high with The Hunger Games and has failed to beat her high score here. Here's hoping Mockingjay will restore my opinions somewhat. 2 / 50 books. 4% done! I took a long break between reading book 1 and 2. Having read 1 last year I immediately launched into the second book gung-ho and thought, yawn. So thought I'd come back to it. The second book was good at recapping from the first, which was good as I could use the reminder but beyond that the first part was incredibly slow. I actually really liked the Quarter Qwell part, because it had that exciting fast paced nature of the games in the first book and I liked the design of the arena. I don't like how Haymitch turned on Katniss in this and the next book a bit, that didn't make any sense to me. Funny how I'm halfway through Catching Fire now and prefer Finnick to Haymitch. Sometimes I think this trilogy really suffers from the first person narrative. It means that Gale and Peeta often seem really flat and that makes the romantic side really dull.